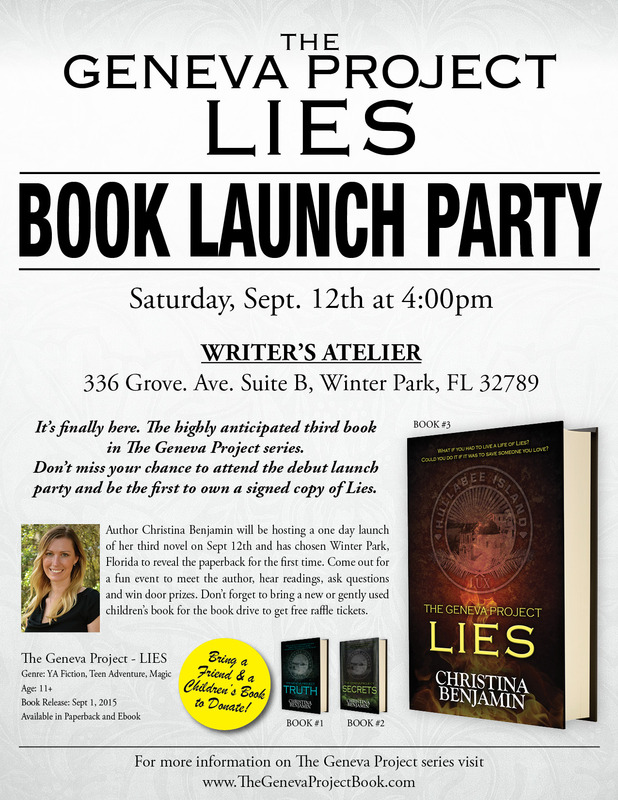 Author Christina Benjamin brings her award-winning young adult fiction series to Writer’s Atelier, in Winter Park, FL. Her debut novel, The Geneva Project – Truth, has won multiple awards, including the Gold Medal for YA fiction at the 2014 Florida Authors & Publishers Awards. The second book in her series, The Geneva Project – Secrets, has enthralled readers by immersing them deeper in her world of magic, myth and legends, leaving them pining for the next installment of the series. Finally the highly anticipated book 3, The Geneva Project – Lies, will release September 1st, 2015. It picks up right where the cliffhanger of Secrets leaves off. The Geneva Project series offers fans of mega-hit YA fiction like Harry Potter, The Hunger Games and Percy Jackson a new series to obsess over. Christina paints a vivid world, where magic and imagination run wild in her epic tale of adventure, courage, friendship and self-discovery. This book series is for ages 10 +, but as with most young adult fiction, its fandom know no limits. Readers of all ages enjoy being immersed in the rich scenery and complex characters. Benjamin’s love of literature started at an early age. She began to write short stories in grade school and practiced her trade all the way through college where she attended the University of Central Florida to complete her Bachelor of Arts Degree in Technical Writing. After spending some time writing for blogs and websites, she decided to get back to her true love of telling stories. Christina currently resides in St. Augustine, Florida with her husband and her character inspiring pets, where she spends her free time working on her book series and speaking at schools to inspire creativity in young writers. She is also passionate about giving back and has created a One-for-One organization that matches her paperback sales and host book drives to bring reading to school, libraries and literacy groups in need. For more information about Christina Benjamin and The Geneva Project series go to www.thegenevaprojectbook.com or follow onwww.facebook.com/thegenevaprojectbook. I’m counting down the days until this party!